A nostalgic trip to Crater Lake National Park finds little has changed. 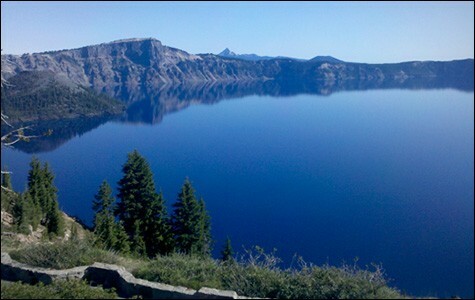 Crater Lake is the world's clearest large body of water. Forty years later, I made the trip back to Crater Lake and, though I rarely repeatsdestinations, I understood why I harbored a calling to return. The lake — formed 7,700 years ago when volcanic Mount Mazama erupted, collapsed, and formed a bathtub basin collecting melted snow and spring water — is a destination of geologic superlatives. While California has Yosemite and other parks worth visiting, Crater Lake — which is located about seventy miles above the California border, in Oregon — shouldn't be overlooked. It is the nation's deepest lake (at 1,943 feet deep) and the world's clearest large body of water (with visibility at 142 feet and moss growing at 400 feet deep). Because it is so clear and so deep, the water contains shades of indigo, neon blue, and deep azure. It makes the waters of the Caribbean seem drab. To top it off, the giant lake is rimmed on all sides by 1,000-foot-high cliffs. Author Cheryl Strayed, who wrote about her hike along the Pacific Crest Trail in the book Wild, told a reporter her favorite spot along that trail was Crater Lake, describing it as a mountain in reverse. Klamath, Takelma, and Molala Indians inhabited Crater Lake long before the first white men, including a prospector named John Hillman, stumbled upon it in 1853. During my first visit, my journalist father was so inspired by the beauty of Crater Lake that he wrote a poem about Hillman's discovery that I tucked into my diary that summer. As a diamond in a field of dross. William Gladstone Steel, a newspaper man himself, must have felt the same solitude when he visited Crater Lake in 1885; after that, he would lobby Congress for seventeen years to designate it as a national park. Steel's goal was realized in 1902, and 95 percent of the park is now managed as wilderness under the provisions of the Wilderness Act. In a constantly changing world, it was refreshing to return to a place that was almost exactly as I left it. When my husband and I entered the park, we saw children in shorts hurling snowballs at each other as they scampered on banks of snow, and I recalled my sisters and I enjoyed the same activity — which seems counterintuitive, given that almost every summer day at Crater Lake is 80 degrees and sunny, and star-filled nights reach a low of 50 degrees. The summers of perfect weather, however, are short-lived. Many of the park's facilities are open only from June to October because the rest of the year the park receives an average of 44 feet of snow. But that welcomes cross-country skiers and snowmobilers, who can traverse the park's unplowed roads throughout winter. And a nearby resort runs a cat skiing program, in which a giant snowcat, normally used for grooming ski runs, takes about a dozen skiers to remote mountaintops so they ski back to the resort through pristine wilderness. My husband and I spent the first night in the park's "cabins," which are actually four duplex-style motel rooms in a small park village seven miles south of the lake's rim. The village also hosts a restaurant, convenience store, and campsites, all nestled in a pine forest above the wildflower-cluttered Annie Creek, which provides the park's drinking water. The next day we hiked the same trail as I did forty years before to the lake's edge to swim in the water. The strenuous hike to and from the lake's edge was much easier than it had felt forty years ago. I like to think I have the stamina of a teenager, but perhaps I also understand how to anticipate the demands of climbing before I begin the ascent and how to pace myself better. The water felt somewhat warmer than I remembered, but the other senses that I experienced as a budding teenager were still charged. As we age, our senses become duller and flatter: Colors are less vibrant, smells are less pungent, and sounds are less clear. These senses were reawakened at Crater Lake, and I felt a surge of euphoric excitement and wonder heighten almost to the same degree as I experienced when I was young. And there were new experiences this time. My husband and I boarded a small cruise boat that took us on a two-hour ranger-guided tour around the perimeter of the lake. It passed two islands, one of which we were able to spend a few hours of fishing, hiking, swimming, and exploring on. After the boat trip, we also climbed another 1,000 feet above the lodge to Garfield Peak for an even better view of the lake, if that were possible. We always prefer hiking to driving, but even the 33-mile Rim Drive around the perimeter of the lake, with 20 scenic overlooks, was a feast for the eyes, with the lake on one side of the two-lane highway and a vast expanse of the Cascade mountain range on the other side. I realized there are definite advantages to growing older. My family didn't stay in the lodge in 1972, but my husband and I were fortunate enough the second night of our trip to snag a corner room on the top floor of the lodge. We had stunning views of the lake from every room, including the bathroom, where an antique clawfoot bathtub was positioned smack in front of two large gabled windows. As I submerged my hike-weary body into a steaming bath with a glass of wine and my camera, I looked over the looming cliffs and the lake as it changed shades by the light of the setting sun, and thought, "Getting older isn't so bad, especially when everything I see remains the same." 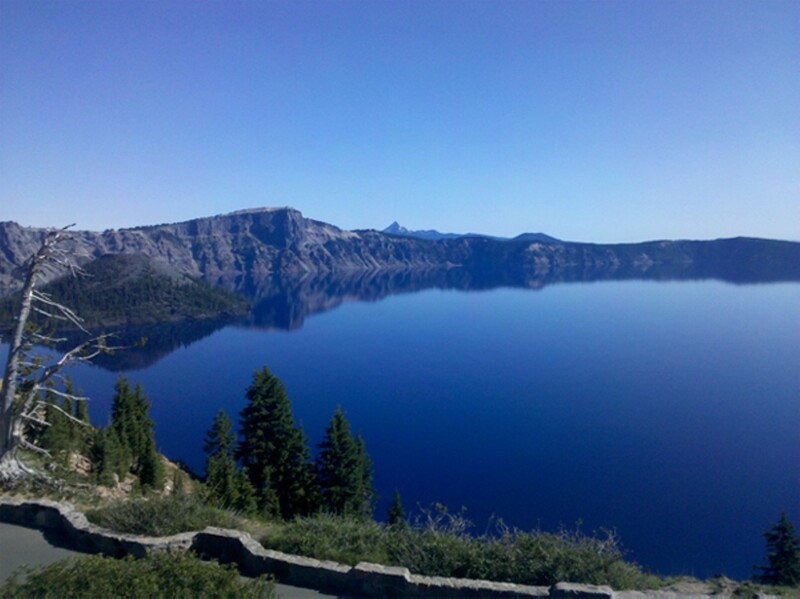 Crater Lake National Park is a two-and-a-half-hour drive from the Eugene airport. Fares start at $220 roundtrip from Oakland International Airport. Entry to the park is $10 for cars and $5 for motorcycles, bicycles, and pedestrians for a seven-day pass. Serves breakfast, lunch, and dinner. Northwest cuisine featuring local fish, mushrooms, berries, wine, and cheese. Reservations required for dinner. Dinner entrées $18-$26. Overlooks Crater Lake. Serves breakfast, lunch, and dinner. American fare with take-out pizza service. Lounge, outdoor seating, and internet at $4 per hour. Dinner buffet $10-$16. Serves "grab-and-go" breakfast and lunch. Soups, salads, and sandwiches. Serves breakfast, lunch, and dinner. Features homemade pies and home-style cooking. Listed on the National Register of Historic Places. Dinner entrées $10-$20. The park features ninety miles of hiking trails, ranging in difficulty. Bicycling is allowed on all paved roads, one unpaved road, and one park trail. All terrains are difficult climbs and descents. Scuba diving and fishing are allowed on the lake, but you must obtain a free permit and carry your own equipment a steep one-mile descent to the lake. Cross-country skiing, cat skiing, and snowmobiling equipment can be rented from Diamond Lake facilities.